Featured as a Finance & Commerce Top Project of 2015, the $20 million St. Paul Academy and Summit School Huss Center for the Performing Arts addition features 36,600 square feet of auditorium and multi-use space. Designed by HGA Architects, the theatre was placed in the middle of the structure and is surrounded by dressing rooms, hallways, a large multipurpose room and a lobby. Between the parking lot and theatre is an outdoor patio, used as a communal gathering space for students and art patrons. MG McGrath, Inc. worked with HGA Architects and McGough Construction to fabricate and install the multiple types of aluminum panels to the exterior and interior of the new state-of-the-art facility. 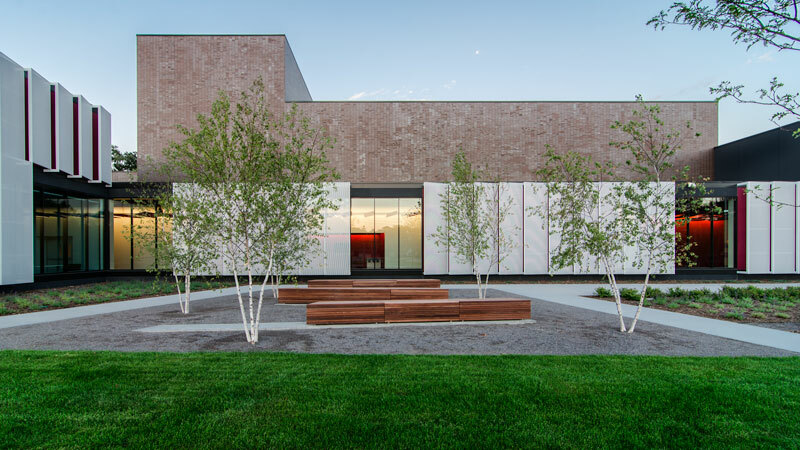 On the exterior, MG McGrath installed the 5,900 square feet of custom-perforated aluminum wall panels and frames, and 225 square feet of Reynobond composite panels, all in custom-match Pure White with a Kynar finish. MG McGrath also installed 1,233 square feet of exterior aluminum window and wall trims in Pure White and Deep Onyx with a Kynar finish. On the interior of the building, MG McGrath installed 3,500 square feet of custom-perforated aluminum sheet wall panels in Bronze Amulet with a Powder Coat finish, and 1,040 custom-perforated aluminum heater fin covers in Silent Delight with a Powder Coat finish. Some of the aluminum wall panels on the first floor of the building’s auditorium were mounted on hinges, allowing the panels to open and the additional acoustical material mounted on the back of them to be exposed.